Almost a decade ago, wildlife biologists were flummoxed when they began finding bats with faces that looked as though they’d been dipped in white powder—the few remaining survivors of an unidentified plague that nearly wiped out their colony. The disease, later named White-nose Syndrome (WNS), is caused by the fungus Pseudogymnoascus destructans and was first found in the U.S. in 2006. Since then, the fungus has been found in 26 states and five Canadian provinces, spread by infected bats and unaware hikers, and is thought to have killed 5 million to 6 million bats. But now researchers have developed a bacterial weapon against the white nose fungus, and they've successfully tested, treated, and released a small group of bats in Hannibal, Mo. While we're still waiting to see how the bats fare, this is a promising treatment for the seven U.S. bat species (and 11 in Europe) known to be infected with WNS. P. destructans attacks bats in two ways: It alters their arousal periods from winter hibernation, causing them to awaken more frequently and expend energy that needs to last them through the winter; and it directly damages the membranes of the bat’s wings, leaving them grounded. 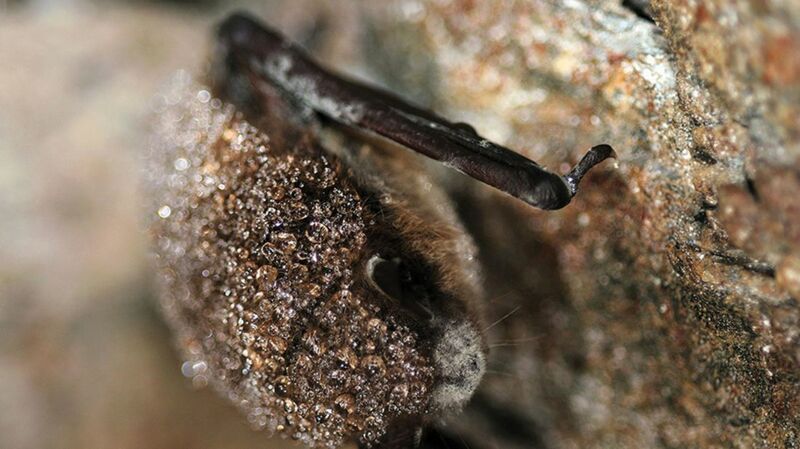 In its advanced stages, the fungal growth is visible on the wings and on the nose, looking like a harmless bit of dryer lint—but it can kill up to 99 percent of bats in affected caves. The average mortality rate is 90 percent. Why is this so alarming? Because bats are some of nature’s unsung heroes. Though feared by many (a phobia known as chiroptophobia), bats are almost universally harmless to humans. Human bites are exceedingly rare, and less than one percent of the notorious blood-sucking vampire bats are positive for the dreaded rabies virus. And while many species of bats can carry exotic viruses such as Ebola, the risk of cross-species transmission of these viruses to humans is very low. In fact, bats improve public health in myriad ways. They pollinate plants; provide guano (bat poop), used as a beneficial fertilizer in some areas; and eat mosquitoes and other pests, protecting humans from mosquito-borne diseases (according a 2011 Popular Mechanics article about the disease, "The bats killed by WNS in 2009 left enough insects uneaten this year to fill 693 tractor-trailers," which is a lot of bugs) while saving the U.S. agricultural industry an estimated $3 billion a year. Even vampire bats aren’t all bad: A chemical from their saliva is being investigated as a "clot-buster" for stroke victims. To counter the fungus's ravages, Georgia State University's Chris Cornelison and colleagues have identified compounds produced by a species of bacteria called Rhodococcus rhodochronus that kills P. destructans in the laboratory. It's these bacterial compounds they used to treat 150 bats experimentally and release 25 of them back into the wild this past spring in Missouri, raising hope for a way to not only treat infection but potentially prevent it in the first place. We won’t know about the bats' survival until later in the fall, but if this bacterial warfare works, it may save not only bats, but also amphibians infected with their own devastating fungal disease.